IS there another name for floppy power connectors - apart from 4-pin FDC connectors? I'm trying to sources some cables that are FDC to FDC rather than molex to FDC or some longer FDC cables that I might be able to join together. As you said the name is exactly male/female 4-pin Molex power connector. Normally pins and housing are sold separately, but there are lot of options for ready made cables - all possible m/f to m/f combinations plus Y-splitters, extenders and etc. No, it's not molex I want. Molex fits the old 3" drive or maybe ide hard drive - but I want the 3.5" floppy connector. It's smaller than molex. Berg ? 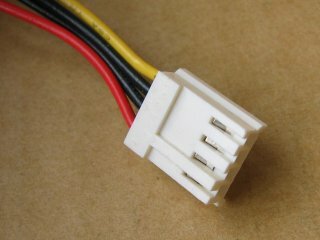 ... sometimes referred to as a Mini-Molex connector. More info here. That's the one. Never heard them called berg before.